Hi guys! I wanted to check in and give you all a little update as to what has been going on with me lately. As most of you know by now, we bought a house and we have been painting the entire interior of the house and we got new floors! It's been super exciting but extremely exhausting. We decided to paint the house ourselves with the help of some friends and family because it is so expensive to get professional painters! When we bought the house it was painted in terrible colors... at least by my taste. So we had to literally paint it from "head to toe". We painted ceilings, trims and walls... even doors. And two weeks later now, it looks lovely and so cozy! Slowly but surely it's coming together and I am finally making it my own. I can't wait to start decorating! Isn't that the best part anyway? We got a beautiful dining room set that will get delivered this Friday! I can't wait to show you guys a little peek at our new place. So all this sounds lovely and amazing, right? It is. But like anything, once it pours with stress... it rains! Our kids were both sick the week we closed on the house! When I say that week, I mean the entire SEVEN days. I had to take Emme to the ER that Sunday because she had a high fever and like any parent, fevers freak me out! She was diagnosed with the flu, thank God it was a mild one but the flu indeed. She was sick for 3 entire days and needless to say I was sleepless and stress out but still thank God that it wasn't worse. Right after Emme was over her flu, Ben started getting sick. Thankfully his was only a virus, but still I hate to see any of kids sick. I was sleepless and worried for 7 days. So now you know why I haven't been around lately. Thank God it is all for good reasons, the new house and the kids were sick but only temporarily. I've been updating Instagram though, so I hope you are following:) I posted some adorable photos of some super fun DIY costumes I made for the kids. ... 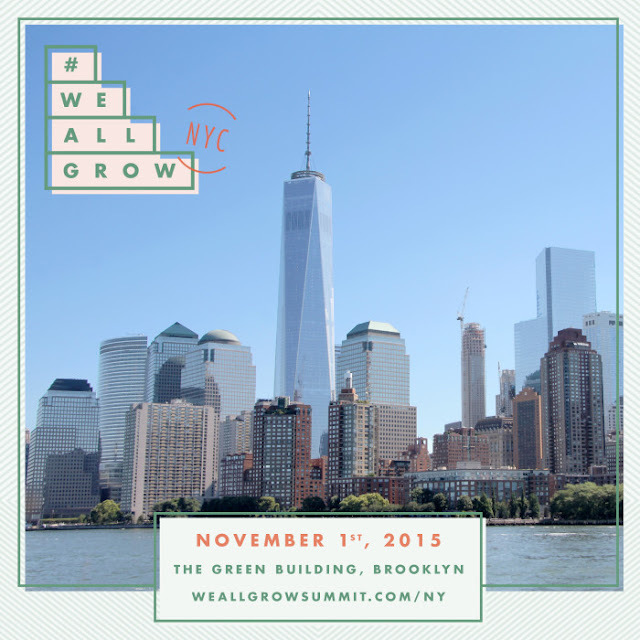 This Sunday is the much anticipated We All Grow New York! And I am so bummed I am going to miss it. We move completely (we've been bringing little things here and there) into the new house this weekend and I guess I was in over my head when I thought I could attend the conference all day in Brooklyn. After talking to a couple of friends I realized I had to let this one go and focus on one thing at a time. And that is the move to our new house. Especially having two small kids. Sometimes you just can't do it all and this was one of those moments. Ugh! Timing. If you are going, have so much fun! And meet as many people as you can. If you want to know more here is the info. It promises to be a very informative and powerful brunch with only the best of the best Latina creators and influencers. Ana Flores and her team do an amazing job and kill it every single time, so I am positive this will be no exception.